"Having the ability to have changing scenarios, updating remotely, has been excellent". Australian railway. "Having the ability to have changing scenarios, updating remotely, has been excellent". 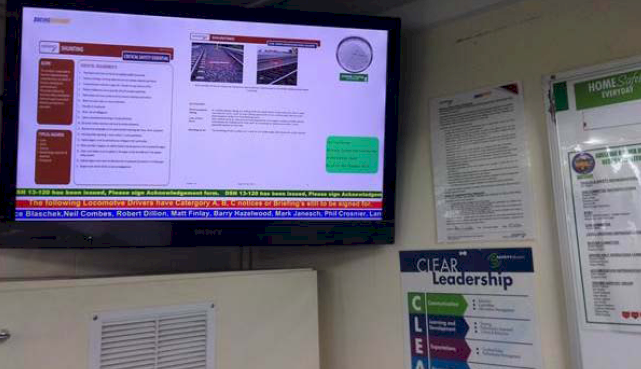 "Around Australia in the Locomotive Drivers Depots, to keep the staff up to date with Business, Safety has been a challenge. The Adelaide Drivers Depot has been using Repeat Signage, with very good results. Having the ability to have changing scenarios, updating remotely, has been excellent. Before it was just PowerPoint rolling through the screen, now I can mix and match scrolling text with the RSS feeds etc". Len Smith, Pacific National. Pacific National is the largest rail forwarding company in Australia. The Bulk Services Division is responsible for all bulk products within the business. Pacific National transports coal, grain and industrial products in NSW and Victoria. It delivers approximately 95 million tonnes of coal per annum by rail to both domestic and export markets.